Please read and understand the terms and conditions set by the university. 1. How and when to ballot for the vehicle sticker? 2. What if I missed the 1st ballot, can I still register and apply it afterwards? No. The balloting is opened once every trimester. Please check online for the ‘start’ and ‘closed’ dates in your UTAR portal/DSA Website. 3. 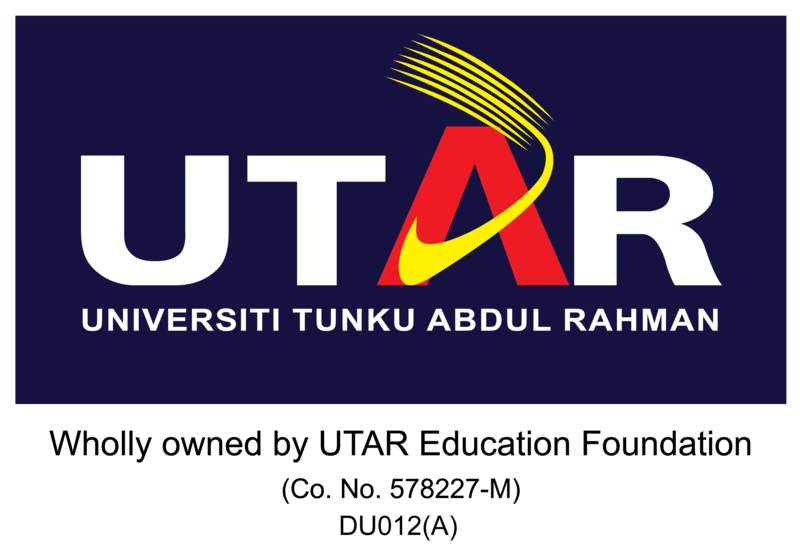 Can I apply for my friend/sibling/relative using my own UTAR portal account? 4. Can I apply using false information in my application? 5. Can I apply for the sticker even though I do not have a vehicle license / my own vehicle? 6. What if I select the wrong type of vehicle after the online submission? Please report to DSA for the amendments before the closing date of the registration period. 7. I am a transfer student from Sungai Long campus. What should I do if the system states Sungai Long campus or vice versa? 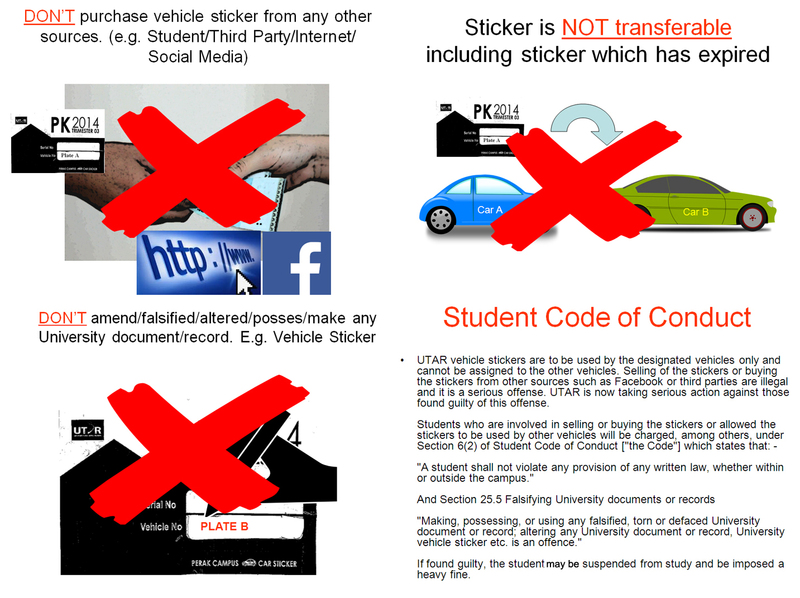 Please contact DSA to change campus then only register for vehicle sticker. 8. Can I do cancellation after the online submission? No. Please decide wisely before applying for the sticker. A fine of RM50 shall be imposed on students in the event of non-collection sticker of their successful ballot with effect from May 2013. 9. What should I do if I did not key in the whole plate number with the alphabets after the online submission? Such a small mistake is still acceptable. However, you must write in a formal letter to DSA for your mistake when you submit your application form. 11. Can I transfer or sell my vehicle sticker to my friend? No. The vehicle sticker is assigned ONLY to the registered vehicle so transfering of a vehicle sticker is totally not allowed. 12. Can I erase off the vehicle plate number written on the sticker and change to another number? 13. What should I do if my vehicle plate number not clearly written on the sticker? Bring your sticker to DSA office for the officer to re-write it on again. 14. What should I do if I lost my sticker? Submit your formal letter and attach it with a police report as an evidence to DSA, RoomC113. 15. What if I am not successful in the first ballot, is it possible for me to appeal? No. However, there will be 2nd& 3rd ballot redrawal from unsuccessful list and this is subject to the availability of stickers. Find out the schedule in your UTAR portal/DSA Website for the 2nd and 3rd ballot. 16. If I have a medical reason, can I appeal? Yes. Submit your formal letter and attach it with doctor’s letter to Department of Student Affairs. It will take about 2-3 days for processing and subjected to approval. Note: Doctor’s letter must be dated no more than 6 months before the date of your appeal. 17. If I am not successful in getting the normal sticker, are there any other types of vehicle pass available in UTAR? 19. If I could not get the sticker, where can I park my vehicle? If you could not get any vehicle sticker, you are advised to use other ways to enter the campus. Example: Cycling / UTAR bus service. 20. Can I just enter through the South entrance gate and park my vehicle outside the East entrance gate or vice versa? 21. What should I do if my vehicle is broken down but I do have the valid vehicle sticker? Proceed to DSA office to request for a temporary pass letter - we will issue you a temporary pass letter (1 to 2 weeks) for your ease to enter the campus. Do not transfer your sticker to another vehicle without DSA acknowledgement & approval. 22. What if I want to change my vehicle to another vehicle? Do not direct transfer the vehicle sticker to another car without DSA approval. Please make sure the 2nd vehicle is belonged to your parent's vehicle and no one has registered the plate number before in the ballot. Submit formal letter, the vehicle sticker, photocopy of two JPJ registration cards (1st & 2nd vehicle) and photocopy of your birthday certificate for verification purpose. Only parent's vehicle is acceptable and subjected to DSA approval. Understanding of how the vehicle ballot system works. The balloting system is implemented to cater the vehicles out-numbered parking slots by 2 to 1. 1. It is a fair system that opens to all full time Foundation and Degree students only. 2. The vehicle balloting number is drawn randomly by the computer system. 3. Motorcycle and Car ballot numbers are drawn separately. No inter-related match. 4. During the balloting, it will be witnessed by student representatives, DIIS representative, and DSSC representative.